The Search Marketing Expo (SMX) East 2014 keynote speaker is Jonah Peretti, founder of BuzzFeed. Peretti has a history of Internet brilliance — before founding BuzzFeed, he was a co-founder of The Huffington Post. For tonight’s finale, Search Engine Land Founding Editor Danny Sullivan will pick Peretti’s brain on the early days of SEO at The Huffington Post, the nature of social sharing, going viral, the nuances of different social networks, the role (or lack thereof) of SEO at BuzzFeed, and more. When you try to make something that works for search and social instead of focusing on just one, you end up making something that doesn’t work for either. Users expect media to be broader than just hard news — having the comics alongside politics, or kitten videos alongside coverage of the Ebola crisis, are appropriate for news sites. Don’t make assumptions about why something succeeds. Test it. Think you went viral because of X, Y and Z? Do X, Y and Z again and see what happens. A lot of times, things aren’t succeeding for the reasons you think they are. Read on to experience more of the keynote conversation with Jonah Peretti. 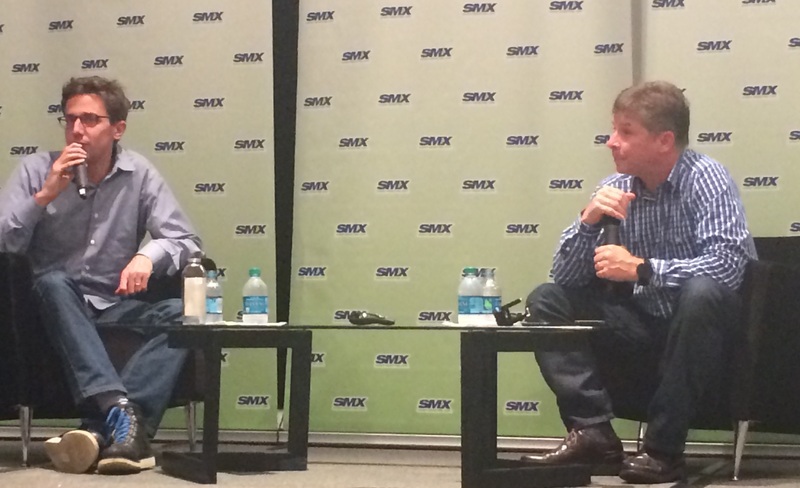 Jonah Peretti fields questions from Danny Sullivan in the SMX East Keynote Conversation. Danny Sullivan: What was it like to pioneer SEO for news content at The Huffington Post? Jonah Peretti: We kind of accidentally discovered SEO. When The Huffington Post first launched, there were not article pages – on the left-hand side there were blog posts and on the right there were links. We didn’t get any search traffic, or very little. We realized as the site started to grow that we needed to add categories beyond politics. What we quickly realized was that (people only went to) the front page. So we started taking the best quotes and articles (and putting them on the home page). And then people linked and visited. We had a tool that showed CTR on headlines, and we had already started editing headlines based on that data, and moving articles around. But during that month of confusion, we started focusing on social. The way search and social work, they’re so different. When you make something to work for both, you end up making something that works for neither. A lot of social sharing is about emotion and connection – when someone shares a cute kitten video, they’re not sharing it because they care about cats; they’re sharing it because they want to share the emotion. If you stuff that with keywords, it detracts from the emotion. Across your network of sites, Facebook was driving four times the traffic of Google in 2013. What is your take — is the BuzzFeed network unique or is Facebook really that much more powerful than Google? I think it depends a little bit on what types of sites you are looking at; increasingly for news content, people are getting more and more of their news on social. Do you still think about SEO at BuzzFeed? We don’t really think about it that much. What I hope would happen is that Google would use more social signals to rank content so that when we make something amazing that is reaching millions of people it would at least show up in Google. (If something is) loved by millions of people and it’s dark to Google (that doesn’t seem right). As a publisher, how do you view Google — as friend or foe? We have a really deep partnership with YouTube; we work a lot with Google via YouTube. We did over 200 million video views on YouTube last month — we focus on shareability of videos — the signal that matters is when they see content on BuzzFeed and they need to share it. If you make things shareable — content that people really, truly love — people will share it and you’ve done a good job. We have a four-acre studio lot in Los Angeles for making videos. We think about Google from a video standpoint. How do you see BuzzFeed trying to balance fun and seriousness? In the past, newspapers have battled over the comics — you couldn’t be a serious political newspaper without having a great comic, because without a great comic, no one would read them. Usually there’s a combo of seriousness and fun. When you look at CBS, you have Big Brother and then you have 60 Minutes — people realize there’s a difference. The fact that it’s all done by CBS is not an issue. In the same way, we can have BuzzFeed News and BuzzFeed Life. When you look at something that does well … you try to understand what it was about that content that (made it go viral). Tell us more about that process. If you think the reason it’s viral is because it has corgis in it, make another post with corgis and see if it goes viral. If you think it’s because it’s tied to a holiday or it’s short or long or because it was posted to Facebook … whatever you think it is, make your statement but don’t assume that you know you’re right. Trying to repeat successes causes you to think both creatively and scientifically … That’s the kind of process that we’re going through all the time and that leads to new kinds of content and discoveries. A lot of time things aren’t working for the reasons you think you are. Google asserts that links on native advertising should be blocked from passing along credit. Do you think publishers in general think about Google rules when they’re doing native advertising? It probably depends on the publisher. It is kind of complicated, but some are sophisticated about search. It is controversial and interesting for Google — if the best content is branded, shouldn’t it still show up at the top of search results? You’ll see “Dear Kitten” show up at the top of search results, and if people were searching for that video and it didn’t show up, Google would be doing a bad job. How does BuzzFeed view Twitter? We love Twitter. Our breaking news Twitter account has been growing really fast. Our reporters will often just post directly to Twitter if it’s a factual, quick thing. Sometimes something is discovered on Twitter and jumps to Facebook — we see something get big on Pinterest from Facebook. It jumps. How does BuzzFeed view Google+? Could you explain (Google+) to me? I had a Google executive tell me that this is the biggest network and I was missing out — but I couldn’t tell if he was playing a prank. If we wanted to put a team on Google+ … where would they start? Is there a single metric you focus on most? Page views? Shares? Engagement? Time on page? Sharing is one of the key ones for us. It shows that you actually want to share this with another person. You don’t just look at sharing, though. (Time on page matters) because if people are sharing without reading you might think, are they sharing this because somehow I made them feel socially obligated to share this? I think that’s really interesting, when he said ‘you can’t target both search and social’. I always thought that you can get both; apparently, the saying is true that you must only serve one master at a time. Awesome tips from good ol’ experimenting.